<-------My first real attempt at this. Woow thats very good I like. Wootness! Though, he looks Latino P= Not that I'm complaining. WHOO! Good-lookin' guy! Oh, yeah! What beautiful eyes and...WOW! *slaps a "Bishounen" sign on his back* =D Awesome pic!! WOWOWOWOWOOW!!!!!!!!!!! thats about as good as it gets... Can you do a pic of Hiei? YES!!! 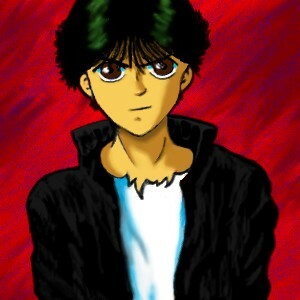 its ALL about yu yu hakusho baby! this is pretty nice! awsome!!! yuyuhakusho is one of my favorite animes!! you should draw botan. Yusukeeee!!! He´s so cool! Very good rawning! cool. the show's characters kinda freak me out a bit cuz they have creepishly long legs sometimes..
thats a tight pic!! very good and a different style. I like it ^^. How did this get showcase? Check the date it was submitted.